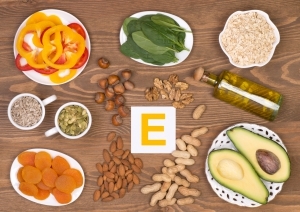 What is a Vitamin E Level test? The Vitamin E blood test measures the blood level of Vitamin E in the body. Vitamin E is a fat-soluble vitamin. It is an antioxidant in the body and plays an important role in nerve function. Deficiencies in Vitamin E can cause anemia and poor nerve function.